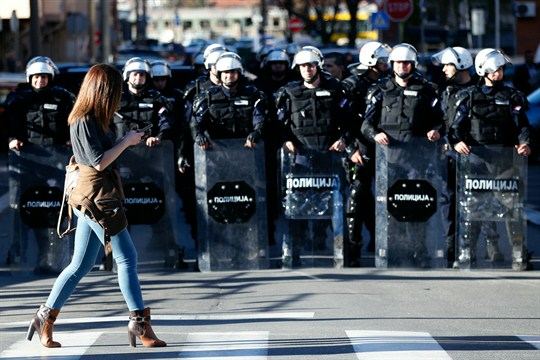 A woman walks in front of a police cordon in front of the police headquarters in Belgrade, Serbia, March 17, 2019 (AP photo by Darko Vojinovic). Serbia’s protests have been hard to miss even if you don’t follow news and politics out of the Balkans. For more than three months, thousands of demonstrators have taken to the streets of Belgrade and other Serbian cities to demand free and fair elections, an end to violent attacks against politicians and journalists and investigations into them, and more independent and unbiased reporting in the country.